Above all, when children are growing up, their mealtimes should be an enjoyable experience, a happy family routine. After the first four months or so when a baby can be introduced to a variety of foods in the form of freshly made creamy purees, parents have the opportunity to lay the foundation for lifelong healthy eating patterns. If eating is fun, babies and toddlers will happily try all kinds of foods, extending their range as they move on to finger foods such as pieces of vegetables and fruit. Small children can get all the sugar they need, and important vitamins too, from little healthy snacks of berries and raisins. Having wholemeal bread, and a wide variety of low calorie fruits and vegetables, as staples in the family diet from the outset, does influence eating patterns. It means children are much more likely to grow up with a healthy lifestyle and to take good eating habits into adulthood. 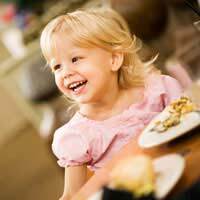 Try to retain the 'occasion' of mealtimes as children grow. Sitting down at the table together reinforces the importance of taking time to enjoy food. It also helps a young family to appreciate good, low calorie food if they are involved in the preparation and cooking of it from time to time. The fat and sugars in this low calorie recipe - both of which are needed by growing children with an active lifestyle - are balanced by the nutritious oats and fruit. Ring the changes in recipes with other dried fruits, or with seeds or nuts for older children, if appropriate. Preheat the oven to Gas mark 4 (180 degrees Celsius). Lightly grease an oblong baking tin. In a large bowl mix together the oats and dried fruit. Melt the butter, sugar and honey in a large saucepan. Add the dry ingredients. Stir and turn with a wooden spoon until they are well coated. Put the mixture into the baking tin and press down firmly with the back of a spoon. Bake for 20-25 minutes until golden. Cool in the tin for 10 minutes before cutting into slices. Make one of the children's favourite treats - keeping it low calorie and additive-free. Mix mince and onion together in a bowl and season with salt and pepper to taste. Form into four large burgers. Put a frying pan over a medium to high heat and spray with oil. Cook the burgers for 5 minutes then turn and put a slice of cheese on each. Cook for another 3-4 minutes and serve straight away, with mustard if liked. These nutritious burgers have only 340 calories each. An even healthier low calorie alternative, with only 195 calories each, are these tasty chicken burgers. 1 tbsp fresh thyme leaves (or 1 tsp dried). Mince the chicken fairly coarsely. Finely chop the onion and sausage meat. Combine all of the ingredients thoroughly. Shape mixture into 4 burgers and cook under a preheated, medium hot grill, for 15 minutes, turning once until cooked and golden. Mix all the vegetables together in a large salad bowl and serve with a low fat mayonnaise or French dressing on a bed of lettuce. Cut the beetroot into strips and put in a mixing bowl. Trim and thinly slice the spring onions and add to the beetroot, stirring well. Mix the sour cream or yogurt with the lemon juice, mustard and seasoning in a jug and pour over beetroot and onions. Stir well and serve immediately or chill in the fridge.